Want to know how to avoid a speeding ticket? Easy – don’t speed. But even the most law-abiding drivers with flawless records can make mistakes and find themselves pulled over. In fact, 34 million people in the United States receive speeding tickets each year, according to the National Motorists Association. A ticket can raise insurance rates and tarnish your driving record, according to FindLaw.com, the nation’s leading website for free legal information. If you get arrested or fined for other traffic violations, those tickets can lead to stiffer fines and penalties. 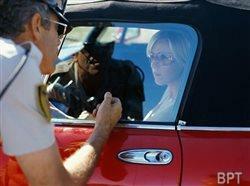 Here are some additional tips from FindLaw.com on how to avoid a speeding ticket. Watch for posted speed limit signs. According to a 2013 survey by Insurance.com, the top excuse for speeding is, “I didn’t see the sign.” The safest way to avoid a speeding ticket is to carefully watch posted signs and not exceed the limit. Even five miles per hour over the speed limit can land you a ticket – particularly near schools, road construction zones and other hotspots where police try to increase safety. Give yourself plenty of time. If you’re running late, you’re more likely to speed. One simple trick you can do to build in some travel time is to set your house clocks a few minutes ahead. Remember, you’ll arrive even later if you get pulled over. Keep a clean driving record. Police cars are often equipped with computer systems that allow law enforcement to instantly look up your driving record. A driver with a clean record is more likely to be let off with a warning than one with several traffic violations. Stay off your cellphone. Cellphone use is legal in some states and illegal in others, but distracted driving should always be avoided. If you are observed speeding and using your phone at the same time, it will dramatically boost your odds of driving away with a ticket, rather than a warning, and it may increase fines associated with the violation. Avoid speed traps. Speed limits typically drop when you approach a small town or city. That’s prime real estate for speed traps. Police often use highway overpasses, bridges or medians with a clear view of oncoming traffic to hunt for speeders. Don’t stand out. Drivers who go too fast, swerve or aggressively pass other drivers are more likely to draw the attention of the police. Move over. After using the left lane to pass a car, move back over to the right lane. Cars that continue to pass other cars while in the left lane are easy targets for police. Also keep in mind that in some states, the left lane is only for passing. Cooperate with the police officer. Being cooperative and respectful toward the police officer who pulls you over is one of the best ways to avoid a speeding ticket. It also can help defuse a potentially stressful situation. If you are pulled over, start by turning off your car, put away your cellphone and place your keys on the dashboard and your hands on the wheel in the 10 and 2 o’clock position to show the officer that you aren’t doing anything illicit before he or she arrives. Taking off your sunglasses also can be a show of respect. If it’s nighttime, turn on the interior lights of your car. Save your arguments for traffic court. If you believe you don’t deserve a speeding ticket, take your argument to court. Don’t argue it with a police officer at the scene. To learn more about speeding tickets and other traffic laws, visit FindLaw.com.